A Voyage Round the World, In the Years MDCCXL, I, II, III, IV. By George Anson, Esq; Commander in Chief of a Squadron of His Majesty’s Ships, Sent upon an Expedition to the South-Seas. Compiled from Papers and other Materials of the Right Honourable George Lord Anson, and published under his Direction, By Richard Walter, M.A. Chaplain of his Majesty’s Ship the Centurion, in that Expedition. - George Anson, Richard Walter 1748 - Printed for the Author, London - First Edition	A finely bound ‘Royal Paper’ copy of the this beautifully illustrated work which ‘has long occupied a distinguished position as a masterpiece of descriptive travel’ (Hill), and ‘a model of what such literature should be’ (Cox). 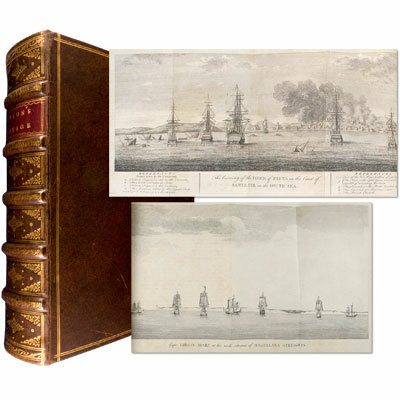 Containing forty two copper-engraved maps, charts, views, and coastal profiles, all but one folding, including views of Brazilian harbours and cities, Acapulco, Tenian, Port St. Julian, Magellan’s Straits, the Bay of Manila, Saipan, Lama, Lantau, Chinese Junks, and others, and large folding maps of South America, the Philippines, and the Pacific Ocean, as well as the twelve page subscriber list, and the two page instructions to the binder. England, at war with Spain in 1739, equipped eight ships under the command of George Anson to harass the Spaniards on the western coast of South America, for the purpose of cutting off Spanish supplies of wealth from the Pacific area. Seven ships were lost and out of 900 men, 600 perished. As usual scurvy took an appalling toll. The Spanish fleet sent out to oppose the British ran into storms; provisions ran out and many ships were wrecked. Thus the primary object of the expedition was not attained, however Anson continued taking prizes off the Pacific coast during 1741-42, and in June 1743, near the Philippines he captured the Spanish galleon Nostra Seigniora de Cabadonga and its treasure of £400,000 sterling, which allowed Anson and the surviving members of his crew to reach England much the richer. ‘According to the DNB (v.16) “Lord Anson, who was a friend and patron of Benjamin Robins, after returning from the voyage around the world in the Centurion, appears to have entrusted to Robins, for revision, the account of the voyage which had been compiled from the journals by his chaplain, Richard Walter. There has been considerable dispute as to whether Robins or Walter wrote the book...” It is probable that Robins revised and edited the work, wrote an introduction, and added dissertations.’ (Hill). Page 319 misnumbered 219, as noted by Cox. Of the approximately 1,500 subscribers listed, 369 have an asterisk beside the denoting those who 'have subscribed for the Royal Paper'. ‘Royal Paper’ size of the 18th century was traditionally watermarked with the arms of Strasbourg, a large fleur-de-lys above a shield with a bend sinister (three lines diagonally across the shield), as used on this copy (here imposed one one chain line and with 27.5mm between chain lines). This is not to be confused with a large fleur-de-lys within a shield which was usually associated with the smaller ‘medium’ and ‘demy’ papers. Below the watermark are the initials LVG (denoting either Dutch paper from Lubertus van Gerrevink, or the equivalent quality from a British paper mill). [see Viola de Gamba Society - Appendix I: Watermarks and Paper Types]. References: Hill, Pacific Voyages, 1817. Cox, Literature of Travel, V1 49.